Justin’s note: As regular readers know, our in-house commodities expert David Forest sees trouble brewing. But this isn’t a time to panic… in fact, savvy commodity investors should be looking forward to a crisis. On Saturday, Dave showed us which specific metals are the best bets to profit on before, during, and after a crisis. Justin: Dave, I understand that you see a financial crisis on the horizon. What are you seeing right now that suggests this? Dave: First and foremost, this bull market in U.S. stocks is over 10 years old now. And bull markets, as you know, don’t go on forever. They always come to an end. We’re also seeing a lot of flashing red lights, or ominous indicators. For example, a rise in the Japanese yen, which in the past has coincided with times of financial trouble as the yen is seen as a safe haven by investors. When I was in Tokyo in 2008, one of the biggest news items in local papers was the rising local currency. During the financial crisis, investors bought yen to protect themselves – causing it to rise 30% against other major currencies like the euro in just a few months. And – although it’s not getting much press – the yen is slowly on the rise now. It’s up 4% against the dollar since November 1, only five months ago… a huge move for a currency. To be fair, that sudden rise has simply brought the yen back to the level it enjoyed early in 2018. But a jump that far that fast is a sign that we need to be thinking about what might happen if another crisis hits. And the rising yen isn’t the only troubling sign. As you know, personal and corporate debt continues to pile up. Household debt is reaching unprecedented levels. It just topped $13.5 trillion in 2018, a new record. We saw a huge run-up in debt before the last financial crisis. And none of those problems were fixed. They all just got kicked down the road. Then, there’s the inverted yield curve. That’s the spread between long-term and short-term Treasuries – when that spread goes negative, it has historically meant that we’re in, or about to enter, a recession. The spread between the 10-year and 3-month Treasury yields has plunged to almost zero in recent months, threatening to go negative. So a lot of red flags are popping up at the same time. This suggests that we could be nearing the end of the bull market in stocks… as well as the business cycle. Justin: What does all this mean for commodities? Dave: Here’s the thing about commodities. They tend to do well in the late stages of the business cycle. Heading into the last financial crisis, gold had a huge spike. Platinum and oil also went on big runs. So spikes in certain commodities can often indicate that we’re in the late stages of the business cycle. We’re seeing that again. Certain commodities are showing signs of life. Palladium – the sister metal to platinum – just had a huge run. It topped $1,600 a few weeks ago, which was an all-time high. Oil is coming back. West Texas Intermediate crude is up 50% since late December. Gold also had a notable bump, rising from $1,200 per ounce in late 2018 to above $1,300. These aren’t the sorts of huge runs we saw in 2007. But certain commodities are coming back to life. 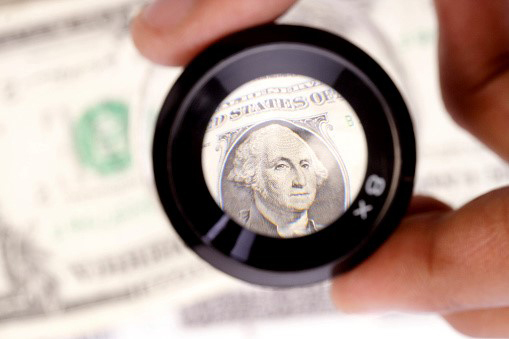 Justin: So should investors be positioning themselves in commodities right now? Or should they be moving to cash? Dave: That’s a great question. My team and I looked into this recently. We analyzed how certain metals – major base metals, minor base metals, and precious metals – fared before, during, and after the last four big financial crises. We found that you need to be very selective about what commodities you own. You especially want to be careful with how much exposure you have to base metals like copper and zinc. These metals tend to get hit hard during financial crises. One reason for this is that there’s a lot of paper investment in copper. In other words, its price isn’t just a reflection of its actual use. Many people are speculating on it. Those people will liquidate their positions if there’s trouble. So I’d be very careful with copper exposure these days. But there are some base metals that fare better. Historically, battery metals like vanadium and cobalt didn’t perform nearly as badly during crises because they don’t have that kind of speculative element in the market. Justin: Interesting. So are there metals that have historically done well during crises? I have a feeling you’re going to say gold. Dave: Yeah. As you suspect, gold is a good place to invest in before and during crises. Based on our research, gold outperformed all the other precious metals. It tends to perform really well ahead of financial crises. For example, gold had a huge run in 2007 and 2008, rising over 50% in under 12 months. So gold is a perfect place to hide if you think there’s a crisis on the horizon. You could make a lot of money in the period leading up to the crash. If you sit on the sidelines, you’re going to miss that. We also found that gold held its value well through crashes. It was almost even. Justin: What about gold stocks? How have they historically fared before and during major crises? Dave: Right. Gold stocks will take a bigger hit than the physical metal if there’s a crash. But the stocks do tend to rebound quickly – faster than the broad market – because the physical metal price stays pretty steady. Look at what happened in 2008. There was a big crash. All the stocks got crushed in September and October. But the gold index basically completely recovered by 2009. Many gold stocks went on to have a big run right up until 2012. So the ideal strategy would be to own gold in the period leading up to the crash. Gold goes on a good run. You make some gains, and take some profits. Then, the crash comes. At that point, you can use some of that cash to build positions in quality names. So I’d personally love for there to be a huge crash. This is because the price of gold should hang in there if everything else falls apart. Gold stocks, on the other hand, could get crushed. But I’d be buying gold stocks hand over fist at that point. I did this during the last crash. In 2008, I paid $0.07 or $0.08 for gold stocks that had been trading at $1.00 the year before. Those stocks later went on to trade for $1.00 again just a few months after I bought them. So the crisis is exactly when you want to be buying gold stocks. Again, this is because the gold price tends to stay constant during periods of turmoil. So you know the stocks are going to bounce back even if they get hammered. Justin: And what about after the crash? Is that also a good time to hold onto gold? Dave: We found that gold, along with the other precious metals, tends to perform really well in the year after crashes. There were easy 10-baggers. There were even a fair number of 100-baggers that investors could’ve realized by buying gold stocks in late 2008, when everything was really beaten up. In the few years immediately after crashes, gold and the other precious metals have been real outperformers. It takes longer for the base metals to come back. Now, there are exceptions. For example, rare earth metals had a really big run in 2010. But that was mainly because China restricted exporting them. So there are cases where other metals do well. But gold, silver, platinum, and palladium have usually done the best in the first few years following a financial crisis. So I want positions in those metals, especially if the next crash is an unprecedented financial collapse, which is what Doug Casey and many other people believe is coming. In that scenario, demand for gold would be through the roof. We could see a huge rebound in its price. Justin: So it sounds like gold is the place to be for both speculators and long-term investors. Dave: Yeah. Based on its track record, gold should deliver the safest and steadiest returns in the coming years. It also has the potential to deliver the biggest gains… before, during, and especially after a crash. That’s why we’ve reduced our non-gold positions over the last couple of months. As a result, the bulk of the International Speculator portfolio is in gold. Justin: Good stuff. Thanks, Dave. Justin’s note: If you haven’t yet, I recommend you watch Dave’s urgent video presentation. As he’ll show you, a radical new technology is about to take down the world leader of electric vehicles… and flood one tiny, specific stock with a massive windfall starting any day now. Go here to get all the details. 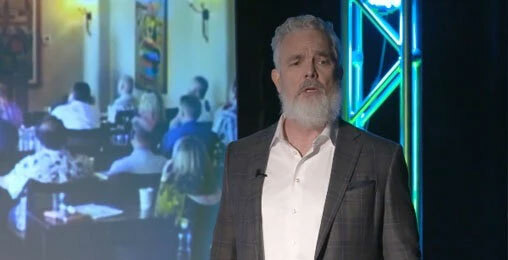 Justin’s note: Yesterday, tech expert and Casey Research friend Jeff Brown showed us why 2019 is the year for artificial intelligence (AI). Artificial intelligence is the most disruptive trend in technology right now… by far. In the past, I’ve said that artificial intelligence will usher in a modern industrial revolution. Steam power and mechanization automated many of our simple physical tasks during the Industrial Revolution… leading to a dramatic shift in the workplace. Machines took over many of the grueling jobs humans aren’t well-suited for. Rather than dooming humans to unemployment, this led to an explosion in productivity that ultimately created many more jobs than it took. There is a tremendous shortage of workers who are trained in artificial intelligence. 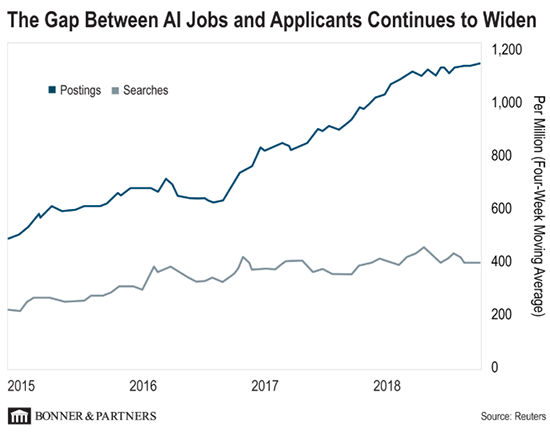 What we see above is the number of AI job postings per million jobs (the blue line) compared to the number of job AI job searches per million jobs (the gray line). In short, there are about 2.9 times more jobs than there are applicants in this industry. That’s how hot the market is. Simply put, AI will be the hottest area for jobs over the next 20 years. The field is so hot that AI specialists with little to no industry experience can expect to make between $300k-$500k per year (in salary and stock), on average. Think about that – half a million dollars right out of school… with no work experience. With experience, the numbers get even more impressive – often into the $1 million-plus range. Clearly, that narrative is only half true. The robots will take some jobs. But there has already been an explosion of new AI jobs. And as the technology advances, AI will lead to the creation of entirely new jobs that we cannot possibly predict today. P.S. Artificial intelligence will remake our world. But it won’t happen overnight. I am glad I am a paid subscriber of The Casey Report. Doug Casey has been correct on just about everything he predicted, even 9/11 (to put it simply). 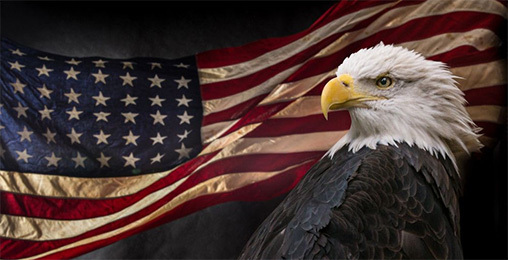 Thank you, Doug, for the great service in world-dominating predictions and the love for physical gold as I have. Be at Casey Research or be square! As always, please send your honest feedback, thoughts, and questions to [email protected].